Doing anything and everything electronically seems to be all the rage these days—even most of your doctors have probably hopped on board. Some things can be quite convenient, such as rescheduling an appointment online through your physician’s portal, or renewing a prescription through your pharmacy’s app. Others may seem convenient, but may not exactly be in your best interest. Something that seems to have popped up on the radar recently are online eye exams. While an automated application on your computer screen has nowhere near the experience and knowledge of an individual that went through four to eight years of schooling (or more! ), there are other downsides you may not have considered. Sure, it may be convenient not to take time off work to renew your prescription. 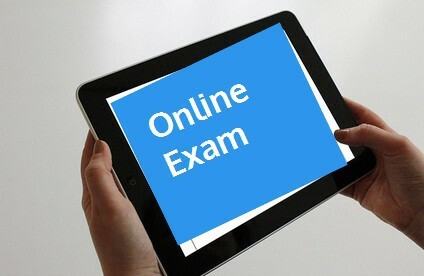 However, many insurances do not cover an online exam, thus the charge becomes an out-of-pocket expense. A typical copay for an in-office eye exam can range from $0-20 with vision insurance. Obtaining a prescription through an online service could cost $40-60, making it even more costly. You may be willing to take this risk, as the convenience may be worth it to you. But what if this new prescription isn’t quite right, or must be tweaked? You’re then stuck taking time off to see your doctor to fix the problem, and paying yet another copay. Typically, when you pay a copay to your doctor for an eye exam, prescription rechecks are included in that original copay. Keep in mind that when you head to the eye doctor’s office for an eye exam, your doctor is checking more than the current prescription of glasses you’re wearing. They are performing a series of measurements to ensure that your eyes are healthy. Your eye pressures are tested for signs of glaucoma, your tear film is examined for dryness, and your eyelids are evaluated for symptoms of infection from contact lenses (if you wear them). Your retinas are examined for early signs of disease, such as macular degeneration, and the natural lens in your eye is checked for cloudiness, often a symptom of beginning cataracts. Many diseases of the body have symptoms that first appear with the eyes. For example, damage to the blood vessels in the back of your eye could indicate diabetes or high blood pressure. “These two conditions are so easy to diagnose with an eye exam, and so many people just aren’t getting routine physicals so eye doctors are often the first to notice them,” says Emily Graubart, MD, an ophthalmology professor in Georgia. You may assume your dry eyes are due to allergies or dry air, but dry eye can result from certain autoimmune disorders. Your eye doctor can perform specific measurements to determine what is causing your dry eye, and if it stems from something serious, can help you treat it. Now, as I work at an eye doctor’s office, I may be biased; however, I’m here to help weigh the pros and cons! Take these things into consideration next time you see that ad on your computer screen for an online eye exam. The convenience may be tempting—but remember that without healthy eyes, a renewed prescription may not help improve your vision after all! Next PostNext Are Contact Lenses for You?